Dance, magic, dance! The Legendary Goodtimes and the Southern Oregon Music Family shakin' it @ Howie's on Front in Medford. The Goodtimes love Saturdays. It's a good day for jumping off speaker cabinets, doing knee slides, windmills, rock kicks, and making all manner of rock faces. Fridays are similarly awesome, of course, but now we turn our attention to last Saturday, when TLG showed up at Howie's On Front to summon The Great Rock Spirits. Matt Jameson, getting really high. Mark's impromptu hair dying in the Howie's men's room turned out great! Mr. Moore, feelin' it like a Sir, as per usual. Medford is homebase to The Legendary Goodtimes; Howie's is about a three minute drive from The Band Cave. The guys were stoked to perform Feats of Rock in their own back yard, including a steaming hot batch of new songs, which might destined for their rumored second album. Brynna and Skyler of 100WM. Opening the evening was Medford's own 100 Watt Mind. Their performance was saucy, sultry, bluesy, and totally badass. TLG considers this band a Crown Jewel of the Rogue Valley music scene--you need to see them, and you should definitely buy their debut album, Out of Night. You could poke somebody's eyes out with that thing!! ...the guitar is dangerous, too. It should go without saying, but just to be clear--a Really Good Time was had by all. 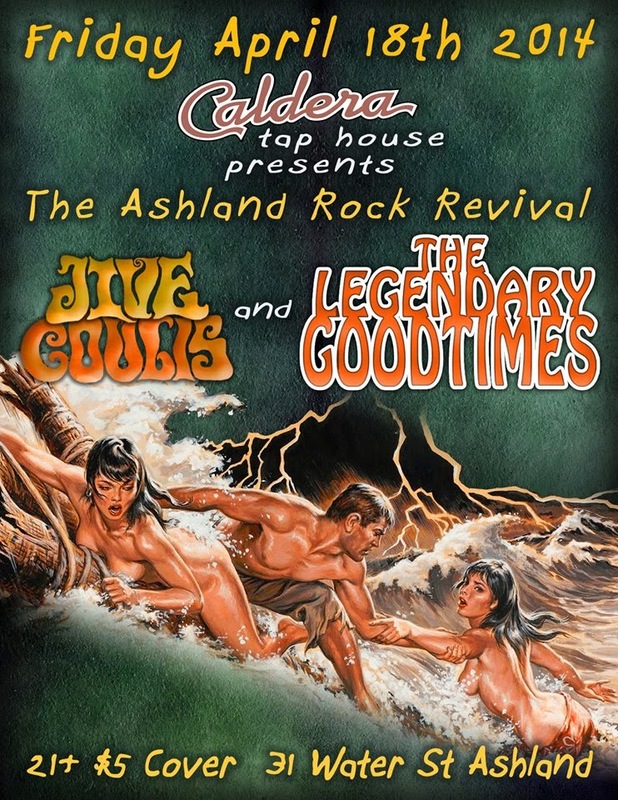 TLG w/ Jive Coulis @ Caldera Tap House in Ashland, 4-18-14. The Legendary Goodtime's gigging season continues April 18th! TLG will be joined by their Brothers in Rock, Ashland's very own rock n' roll behemoth, Jive Coulis! Come on down to Caldera Tap House and enjoy some of Southern Oregon's best rock n' roll and microbrews. Don't miss it, and keep checking back for more Low O' music shenanigans!